While the winemaking at Mudhouse is firmly anchored in the world of microdetail, the team don’t tell tales of pampered grapes, brix levels and the size of the stones beneath the vines. Just take their word for it that they go to extraordinary lengths to get it right every time. When all is said and done, what’s is the only story that matters. When you take the first sip of Mudhouse, it just may bring a smile to your lips. No amount of pontificating about winemaking can say as much as that magical moment. 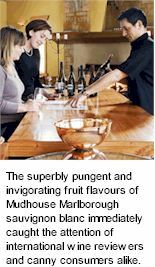 The superbly pungent and invigorating fruit flavours of Mudhouse Marlborough sauvignon blanc immediately caught the attention of international wine commentators and consumers. Due in no small part to the superlative growing conditions on the estate's Marlborouigh Vineyard at Delta Lake Heights near Renwick in the Upper Wairau Valley, the site is 250 acres of the best fruit growing terrain, clay and loam soils which are planted to Sauvignon Blanc and some Pinot Gris. 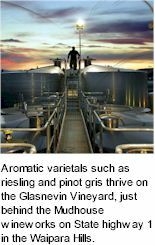 Aromatic varietals such as riesling and pinot gris thrive on the Glasnevin Vineyard, just behind the Mudhouse wineworks on State highway 1 in the Waipara Hills. This very special winegrowing region also makes spicy, deliciously rich, well rounded pinot noirs. Shelter provided by the coastal hills to the east is an important feature of Waipara’s grape-growing environment, giving harvest dates 10 days to two weeks earlier than on the Canterbury Plains. Hot nor’westers dry out the soil, taking some of the vigour out of the vines which encourages the development of full ripeness and intensity. Soil types range from gravelly deposits close to the Waipara River, to heavier, limestone-derived clays on the east side of the valley. Central Otago is famous for vibrant, full-flavoured pinot noir with spicy, cherry-like flavours and a velvety smooth texture. There are few places in the world around the 45-degree latitudes, north or south, with such ideal climate and soil conditions for pinot noir. That’s why Mudhouse are here. Hot summers, cold winters and enormous temperature extremes between day and night create the intense flavours and colour. The vvineyards here have stony sub-soils, with good water drainage, helping to promote ripe, intense, aromatic characters in the finished wine. Within the family you will discover three labels, Mudhouse, Swan and Hay Maker. At the top end is the elite Swan label, each wine within this range offers small parcel reserve quality. The philosophy is to nurture the grape from vine to wine with as little interference as possible ensuring pure varietal character and flavour. Every year the Mudhouse oenological crew are on the search for the best parcels of fruit they can find, with the intention of crafting a wine good enough to hold the Swan label. Wines branded plainly as Mudhouse represent 90% of total production, they absorb the energy, passion and unflinching devotion to good winemaking. By using a combination of contemporary and traditional methods, Mudhouse are able to meet market demand without sacrificing quality. Every bottle goes out into the world as a highly qualified ambassador for premium New Zealand wine. The Hay Maker range takes full advantage of New Zealand array of world class vineyards to craft a knockout multiregional wine. It takes a lot of heart to craft a Hay Maker, as the crew heroically journey up and down New Zealand in search of good vineyards that offer high quality parcels of fruit. The team have come up with a stunner of a Marlborough Sauvignon Blanc, beauties from the Hawke's Bay, a Merlot and a Chardonnay, and a very sound indeed South Island Riesling. You're not expected to swirl, sniff, gulp and spit these prime examples of New Zealand wine magic, just sip and enjoy.